« Vlad Draws a Walk! When I saw Michael Oher going off on twitter yesterday about character issues, I assumed it was in a general defense of new teammate Jimmy Smith. However, I was mistaken. Oher was actually aiming his tweets directly at ESPN’s Todd McShay, and not for his criticisms of Smith this year, but for his comments about Oher’s own “character issues” back in 2009. “What is Character issues?! ?” Oher wrote on his Twitter account in a rare rant from him. “Somebody tell me? I never got in trouble with the Law . . . yes sir no sir guy . . . But this Todd Mcshay guy acts if he knows ppl on a personal level get real!” What if someone was to talk about your son . . . and he had character issues!! 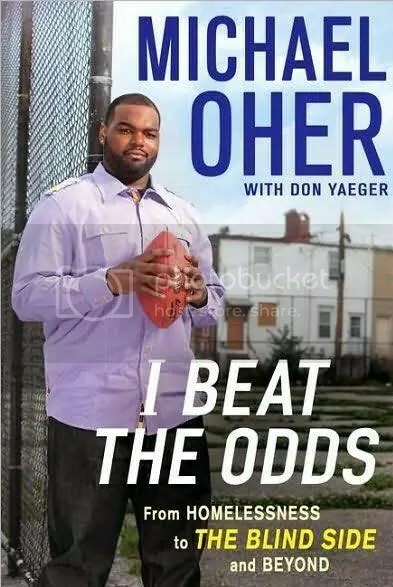 If you have any questions about Michael Oher’s character, Todd Mcshay (or anybody else), I urge you to take a look at our review of his book “I Beat the Odds,” and maybe pick up a copy for yourself. This entry was posted on May 4, 2011 at 8:55 am and is filed under Hating, Ravens. You can follow any responses to this entry through the RSS 2.0 feed. You can skip to the end and leave a response. Pinging is currently not allowed. Michael Oher is just mad because they made a movie about him and they portrayed him as being slow. Ngata dropped to Baltimore because of character issues. I remember Schlereth killing Ngata when he got drafted saying he takes plays off during games and he is lazy. Suggs dropped to us because of character issues. Both Ngata and Suggs been nothing but hard workers and fine players off the field and on the field.